If you’re needing blinds and are not sure whether to go for Rollers or Venetians, or if Vertical blinds will work in a high traffic area, then this article is for you. We cover the different types of commercial blinds available, and give you the low down on the pros and cons of each. Roller blinds are incredibly versatile, and can cover almost any application. Suitable for high level windows and large areas of glazing, the sturdy Rolshade 430 comes in screen, dimout and blackout fabric depending on the amount of light you want. They can be chain controlled (as standard) crank controlled (good for anti-tampering) and electric. Features like side guides allow them to cover sloping windows as well. Stylish and low maintenance, the Rolshade requires only a wipe down with a damp cloth to keep it looking good. It’s unobtrusive and minimal, blending in easily with any interior scheme. If it’s glare control that’s your main priority however, vertical or Venetian blinds would be more effective at diffusing the light. 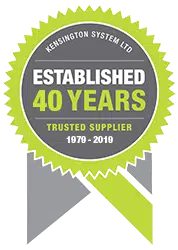 Verdict: Our recommended choice for almost any application requiring commercial blinds. They’re versatile, unobtrusive and good value for money. Vertical blinds allow almost infinitely adjustable light control, controlling both light levels and glare. This tends to work well for an environment where glare especially can be an issue – for instance, we recently installed Louvashade vertical blinds in a hotel dining room to reduce glare and increase comfort for the diners. Louvashade’s other advantage is that it covers the entire window and is therefore more effective at blocking solar gain. They are available in blackout and dimout fabric and again are good value for money. The disadvantage of verticals is the slightly cluttered look – it just doesn’t look as nice as a roller or venetian blind. They are also more prone to vandalism, as unlike other blinds, they can’t be pulled up out the way. This means that they aren’t necessarily best for high-traffic areas. Verdict: If you want complete adjustability and control, and don’t mind the slightly messy look, then Louvashade might be for you. Electric blinds are the ultimate convenienc e – you can control light and ambience with the click of a button. Usually roller or sometimes vertical blinds, they’re ideal for high level windows or skylights which are hard to reach. Large areas of glazing are also good candidates for electric blinds for obvious reasons – individually lowering several blinds makes no sense when you can do it all at once with a single remote! Electric blinds like the Rolshade 430E are also a good choice for high level windows in that they remove the health and safety hazard and not-too-beautiful aesthetic of trailing chains and cords. If you’re after a classy, understated, minimal feel, electric blinds are your friend. They will be more expensive than manual blinds; but when compared with the convenience and ease with which they allow you to control the environment, many people decide it’s worth it. Verdict: Classy and incredibly convenient, electric blinds offer easy operation and a neat finish. They’re also ideal for hard to reach areas, but will cost more than manual. Blackout blinds are different from roller blinds in that the fabric is zipped into metal channels on each side of the blind, which are then fitted directly to the window reveal. This ensures that when the blinds are down no chink of light comes in. The fabric used is also different to the blackout fabric used for rollers. Solshade 830 blackout blinds are not often recommended as commercial blinds, as they’re usually used for more specialised applications, like laboratories or conference rooms. They are available as crank operated or electric. Verdict: These are specialised blinds – if you need a completely controllable environment (like a lab) then use Solshade blackout blinds. If you don’t mind that some light escapes at the side of the blinds, then go for Rolshade 430 roller blinds – they’ll do the job almost as well, are less bulky and much cheaper. Using Venetian blinds makes a style statement, especially as there is a large choice of styles – like Alushade aluminium and Timbashade wooden Venetians available. The slats are very adjustable and work similarly to vertical blinds in diffusing light and reducing glare. They also score higher on aesthetics. However, the single biggest issue with Venetians is the constant maintenance. Horizontal slats tend to collect the dust, which then becomes patently obvious when the sun shines through them, and the blinds look dirty. If you don’t mind dusting them weekly, then this isn’t a problem – but if that’s not possible, we would advise Louvashade vertical blinds, or Rolshade rollers if aesthetics are important. Although similar in function to vertical blinds, they will be slightly more expensive as the slats are made of metal, plastic or timber rather than fabric. Verdict: Very stylish and adjustable, Alushade Venetian blinds will look great in your office. But if you don’t want constant maintenance, then go for Louvashade or Rolshade instead. 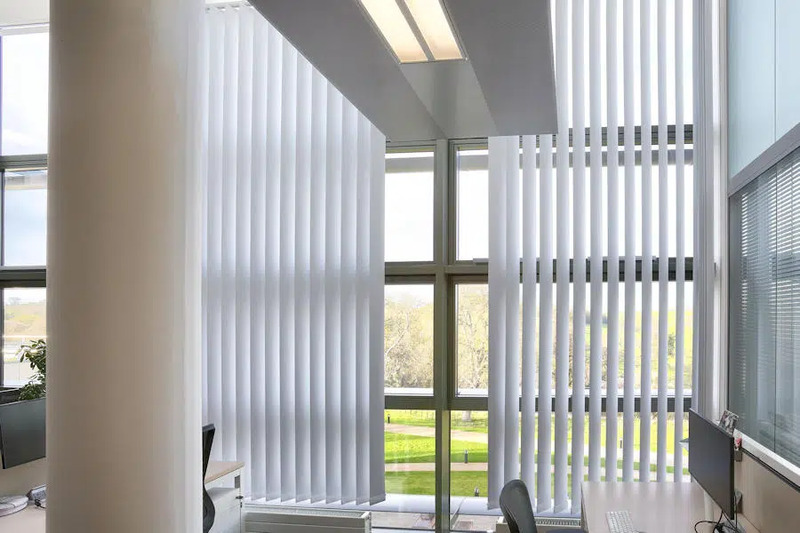 We would recommend Rolshade roller blinds for almost any commercial blinds application because they are versatile, unobtrusive and good value for money; if however reducing glare is your main priority then Louvashade vertical blinds are best for you. Electric blinds are a stylish and convenient choice. With commercial blinds, be aware that you will get what you pay for – with rollers especially. A price that’s ‘too good to be true’ could equal cheap ‘toilet paper’ fabric and poor quality hardware. For maximum safety, ensure that your blinds are made from Fire Resistant fabric. The amount of light the blinds allow through depends to a great extent on the type of fabric you choose – check out our fabric range to see for yourself.